After Josephine returned to health, she delivered a litter of kittens that impressed people with their sweetness and sociability. Although any difference in temperament could be explained by natural variation or having different fathers, a highly unscientific theory, that the accident somehow accounted for the kittens docile nature persists to this day. Baker gathered as many of Josephine's kittens as possible and began breeding to preserve the wonderful personality of these cats that went as limp as a rag doll when cuddled. She gave the cats the angelic name Cherubim. The most well-known of Josephine's random-bred offspring were Buckwheat, a black shorthair female who resembled a Burmese, and Daddy Warbucks, a male with Birman-like points (dark face, ears, tail and legs) and mitts (white paws). Many of the Cherubim had points and mitts, but others came in a rainbow of solid colours and bi-colour variations. Baker called these non-pointed and non-mitted cats Miracle Ragdolls. Determined to direct the progress of her Cherubim cats, Baker developed strict rules for anyone wishing to breed them. She alone knew the ancestry of each cat and made all breeding decisions. In 1967, a group split away from Baker's control, taking their cats to mainstream registries to show and make their own breeding choices. They chose to call their cats Ragdolls and to breed only pointed cats in three patterns. Bitter over this defection, Baker took steps to exert greater control over the development of "her" breed. She set up her own registry, the International Ragdoll Cat Association, and required all her breeders to register only with her. Baker patented the name Ragdoll for use only with cats of her breeding and registry. Catteries were franchised and paid royalties for each kitten sold. For more than 20 years, Baker's program continued, with Cherubim breeders relatively content to enjoy raising the kittens while allowing Baker to make marketing and breeding decisions. Eventually, even her loyal group developed misgivings about Baker, who struggled to keep a healthy cattery while handling the responsibilities of the registry. Her stories about the breed's origin grew increasingly strange, linking them to extraterrestrials and human-gene-implantation experiments. By 1993 a group of breeders including Janet Klarmann, Curt Gehm and Kim Clark persuaded Baker to retire and planned to take over management of the association. After a few months, however, Baker refused to relinquish control. Regretfully, the group voted to leave IRCA and seek recognition with established registries. Since their cats included all colours and patterns and they signed contracts not to use the Ragdoll name, the first crisis focused on what to call the cats, in the process of submitting a standard to American Cat Fanciers' Association. Klarmann credits Curt Gehm of Liebling Cats in Virginia with the choice of "RagaMuffin" because they came from the endearing little urchin cats of Riverside. The M is capitalized "because they're big huggable, loveable Muffins," says Klarmann, who operates Encore Cattery in Florida. The new name stuck and in May 2001 the cats gained championship recognition. The American Association of Cat Enthusiasts, United Feline Organization and Cat Fanciers' Federation also recognize the breed. From the beginning, RagaMuffin breeders have faced the challenge of gaining acceptance for their cats as a distinct breed, despite their common origins with Ragdolls. The patterns that form so important a part of the Ragdoll standard receive little emphasis from RagaMuffin breeders. They accept every colour and pattern, with or without white. But the differences go deeper than that. The RagaMuffin has a distinct head shape. Rather than having a flat plane between the ears, the skull has a slight dome. 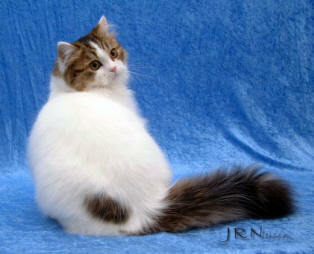 The RagaMuffin has a shorter nose than the Ragdoll, and walnut-shaped eyes rather than oval. While the Ragdoll profile exhibits a gentle curve with the final segment straight, the RagaMuffin standard requires an obvious nose dip or scoop. RagaMuffin breeders aim to produce a rounded, more heavily boned cat and have used Persians, Himalayans, Ragdolls and unregistered domestic longhairs to broaden the gene pool. Currently only registered cats may be used, and breeding to Ragdolls will cease as of 2010. Kim Clark, owner of Ultimate Rags cattery in Ft. Lauderdale, Fla., echoes the words of other breeders when she describes the RagaMuffin's coat as texturally similar to a rabbit's coat, shorter and thicker than the Ragdoll's medium-long, silky coat. When asked about the cats' personality, Klarmann, the ACFA and AACE breed committee chairperson, says, "That's the best part," using words like "wonderful" and "perfect" to describe her favourite breed. Melody, her first Cherubim, impressed her with an unhesitating sociability though she was cage-raised. "Their ideal family would probably include children," says longtime breeder Gehm. "This is the kind of pet that children will remember for the rest of their lives." Appearance - RagaMuffins are large, muscular, heavy cats that do not reach full maturity until approximately 4 years old. Females can be substantially smaller than males. The look of the body is rectangular, with broad chest and powerful shoulders supporting a short neck. This muscular and fit cat often has a fatty pad in the lower abdomen. The head is a broad modified wedge with a rounded forehead and obvious nose dip. Large, walnut shaped eyes give a sweet appearance. These longhaired cats have a dense and silky coat, like that of a heavily furred rabbit, and the hair grows longer around the neck and face (a ruff), increases in length toward the stomach and gives a wispy frill on the hind legs. Every possible colour and pattern is allowable, with little emphasis placed on perfection of markings. Personality - The only extreme allowed in this breed is its very docile nature. These cats love people and are affectionate and cuddly, with a tendency to go limp when held. They do nearly anything for a tummy rub. While not terribly athletic, they love playing, climbing scratch posts, chasing laser lights and fetching toys. They greet family members and strangers at the door. Lifestyle - RagaMuffins remain underfoot and want involvement in what their people do. They get along well with children and other pets. Although they can adapt to a wide range of lifestyles, they are never aloof and thrive on companionship. Grooming - The plush, low-maintenance coat resists matting and is easily cared for with a few minutes of brushing or combing twice a week. Provide a bath every few months and trim nails and clean ears periodically.